Loan Comparison for Excel provides a powerful and flexible set of loan calculation tools to analyze loan dynamics. The loan calculators are designed to easily set up and compare different loan options. Comparing the attributes of different loan structures can help to determine the most optimal financing option. Loan Comparison for Excel are easy to use with many features and options. 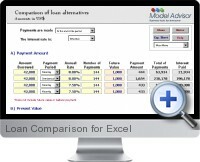 Simply enter the required data and Loan Comparison for Excel automatically calculates the results. The resulting analysis can then be exported to a new workbook to personalize and distribute. Loan Comparison for Excel includes calculators for 4 cash flow valuations, 14 loan types and 8 other financial calculations.